Around BuffaLowe: Vizual Zine Chats with Jason D’Aquino [Interview] – Be Fearless. Be Flagrant. These cool folks over here at vizualzine.com did an interview with my long-time tattoo artist Jason D’Aquino, of Leviathan Tattoo (formerly Blue Moon) in the North Buffalo district of Buffalo, NY. Not only can he lace you with spectacular ink on your skin, but Jason has a beautiful talent for drawing on miniature matchbooks and more. These guys caught up with D’Aquino after the recent 10th Edition: Art Basel in Miami, FL that just passed December 1st-4th where he had featured work. Tell us about Jason D’Aquino. I am a professional artist, a miniaturist who works primarily in graphite surfaces. My work is done with the help of high-power glasses, which often do not exceed 1 “X1” scale. How would you define your work? Do you think that your work has evolved or has it kept relatively similar to that which was in the beginning of your career? My work entails re-contextualizing discarded items. A large part of what I enjoy about my CHOSEN medium, is taking a worthless scrap of paper, adding a few cents worth of graphite and a little time, and turning it Into a coveted piece of art-It’s giving a new life to something cast -off. My work has definitely evolved. I’ve been drawing and painting for as long as I can remember. You go through “phases of development” … I did not begin showing my work in ESTABLISHED galleries until 2000 – and the concept of the miniature work was still in it’s formative stages … I was living with a jeweler in Kingston, NY at the time – working for a high-end designer cutting diamonds in platinum seats for rings (very small scale detail-oriented work), so small in fact, that I had to wear special magnification glasses when I worked. One day I brought them home from work, and I tried them on. At first, it was a challenge, to see how steady my hand was, but after that, I fell in love with all the possibilities. 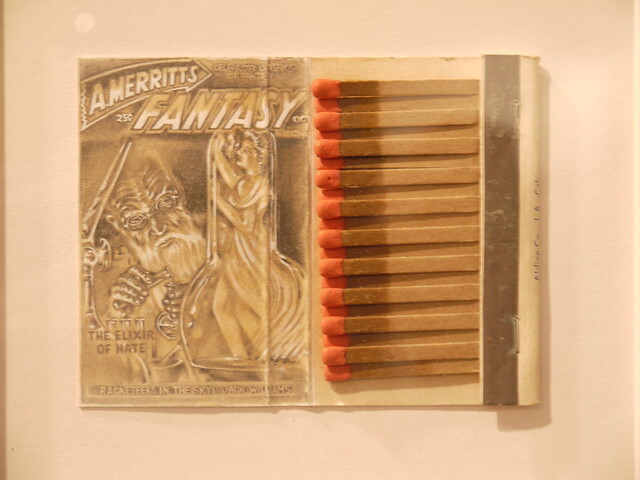 Using a matchbook as a canvas was something I happened upon later. The wonderful part about it, is that no matter how the work is viewed, whether initially in person, in print, or on a computer screen, the viewer can instantly recognize that the work is miniature. The matchbook is a familiar object, and carries with it, a built-in visual scale reference.